Imagine yourself living in quiet top flr unit at the Essex House on highly coveted and Cherry tree-lined Bigelow Ave. N. Perfect residential location on “Crown of QA”, w/easy access to vibrant QA Ave, arterials to Gates Foundation, Amazon and more. Enjoy your own fml entry w/glistening hdwd flrs. You be pulled in by the jaw-dropping city, lake and mtn views. Newer kitch, bath w/new fixtures, fml din rm, fp, and fab bdrm w/closet blt-ins. 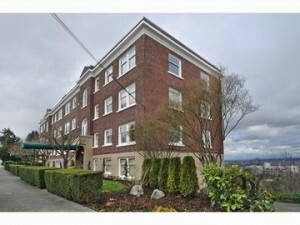 W/D in unit, pkg, stg, pets ok. Dues incl Heat & EQ Ins.